My encounter with the Hat Man took place not long after I graduated high school in 2003. I’d had a few experiences with the paranormal in my childhood but nothing really worth noting. The most significant experience I’d had was seeing an apparition at a campground when I was 13. But I can even dismiss that experience as something I might have just mistaken as paranormal. Only the Hat Man stands out in my memory as something out of the norm, something that I can’t explain away. It was sometime in early winter when I had the “Hat Man” experience. It was a cold and overcast day when I and my boyfriend at the time decided to take a short hike down the railroad tracks that follow the Brandywine River. Hiking was something we did quite a lot since we both loved being outdoors as we were too broke to do anything else. We started out in Embreeville County Park where the Brandywine and the train tracks run parallel to each other. The area has a lot of long forgotten history such as an old poor man’s cemetery and ruins of stone buildings. I also heard that during the Revolutionary War, some British and/or Hessian soldiers camped out in the area before the battle of the Brandywine. To continue, we were about a mile or so into the hike when I saw an empty turtle shell off to the side of the tracks. I thought this a bit strange until I saw some stones laid out in what seemed a deliberate pattern. They were in the shape of a circle divided into what appeared to be the outline of a cross (some kind of solar cross I think). I pointed it out to Johnny who got very excited about the turtle shell. It didn’t think much of it but I did think it somewhat odd that someone would pick this random spot to arrange such a pattern. I don’t know if it had anything to do with the Hat Man but I thought it worth mentioning. We then decided to take a break and sat down on the edge of a nearby bridge. This is when I started to feel very uncomfortable; it was an ominous sort of feeling. It was really unsettling but I didn’t say anything since I’ve always been an anxious person. Also the cold was bothering me a bit. However the longer we sat there, the stronger the feeling became. I remember getting up and pacing a little. I began to feel like I wanted to just go home, but we’d only been out there for an hour, and I didn’t want to seem like a whiner. Finally, Johnny asked me what was wrong and I told him I felt weird and tired and wanted to head back home. He thought I was mad at him for some reason, but I insisted I wasn’t, just that I was probably just tired from work the day before. He got up and gave me a reassuring hug. Suddenly the ominous feeling intensified as I felt we were being watched which was ridiculous because we were in the middle of the woods. But my attempts at reasoning didn’t diminish the now growing sense of dread. Fear began to wash over me as something over Johnny’s shoulder caught my eye. Off to my right, on the opposite side of the tracks there was a hill that had been partially cleared for electrical transformers. At the edge of the woods there was something moving up the hill but away from us. I was sort of relieved for the smallest second thinking, “It’s just some person up there looking at us!” But then it stepped out of the woods into the clearing. It was a figure of a person but something inside was telling me that it wasn’t human. It was ALL BLACK from head to toe. It was so black that it seemed to absorb the light around it. It was one solid mass of super concentrated darkness. This thing was wearing a trench coat or a cape and a wide brimmed hat. I couldn’t make out any facial features; it seemed to be literally made out of pitch. It took several long strides into the clearing and stood at the base of the transformer, hands in its pockets or at least it looked that way. It stared at me the entire time, never looking away to navigate. The second it had revealed itself from the cover of the trees lining the clearing I felt terror unlike anything I’ve ever experienced before or since. I remember vaguely wondering why I would react like this to what I still wanted to believe was just some idiot dressed in weird clothes. I wondered if it was possible that my eyes were playing tricks on me or maybe I’d just gone off the deep end and was hallucinating. I felt as though my blood had literally turned to ice and my heart had dropped out of my chest. It wasn’t panic; I know what panic feels like. This was different; it was dread, foreboding, sinister and awful. Johnny must have felt me freeze up or maybe I said something to him. For the life of me I can’t remember because I was petrified. Just then Johnny turned and saw the thing standing on the hill. I remember him saying in a very confused and frightened tone, “What the f*** is that?” At that point any concerns I had about my own sanity were extinguished. This was NOT normal and even worse, it was real. I remember wondering if being insane might not be so terrible. At least it would provide a logical explanation. I’m not sure if I was walking or running, I just knew I was moving, away….Away from this horrible, evil, dark thing. It wasn’t a moment and there was Johnny was behind me, I guess he’d either changed his mind or had been trying to be tough. At that point it didn’t matter as I was glad he was with me. I took one last look over my shoulder to make sure it wasn’t following us. Blackie had in fact climbed further up the hill, as if he were trying to keep me in view. However it wasn’t following which was the most important thing at the time. The Hat Man…Yes, that is the name I eventually gave it. The Hat Man just stood, watching. We retreated to the car as quickly as possible. At that point I was feeling just slightly less threatened but still very distraught. We got in the car, Johnny on the driver’s side and the engine roared to life. He kicked it in gear and we sped out of there as fast as we could go. On the drive home I struggled to make sense of what had just happened but for some reason I didn’t say a word nor did Johnny. In fact we never spoke of the Hat Man again. As much as I love to tell stories and relate my experiences to anyone who will listen I held the Hat Man inside, eventually telling my best friend but no one else. Frankly I just couldn’t talk about it as those terrible feelings would come rushing back almost haunting me with residual evil. It has been just recently that I was able to start opening up about the Hat Man. I drew a rough sketch of what the thing had looked like. My friend said she’d seen something very similar on the internet and that other people had seen it too. I did my own search and was completely shocked when I found a drawing someone else had done. It was identical to what I’d seen! I’ve been looking into everything I can about the Hat Man since and started telling some of my friends and family about it. I’ve found that the more I talk about it, the less it frightened me the way it used to. In all my time researching the Hat Man I’ve yet to find anyone who’s seen him in broad daylight in the middle of the woods. Most of the accounts I read were of him appearing in people’s bedrooms and similar locations. I wonder why I saw him the way I did and if it means something. I just wanted to hear what people thought about it, and if anyone has a theory or knows anything about what the heck this thing is, I’d love to hear you. I just read your story and I found it so terrifying. I have seen the dark shadow man all my life, but never in broad daylight. I can’t explain what I see when it happens, but I know I wake up screaming and feeling I am going to have a heart attack. I know I have hiked in many forests in my lifetime. I felt that foreboding feeling of someone watching me and my friend at the time. I now pay attention to that feeling, so does my current partner. He is avid outdoors man and a hunter. He knows and understands there is reason for fear in the woods. He looks at it a different way than I do which is to say that he feels there is a mountain lion or a bear that is watching us. I feel it may be another reason. I know we pay attention and just leave the area. The worst experience I had was in the woods of Crater Lake in the 80’s. My partner at the time were taking a break on the side of the road making coffee on the camp stove. This area had nothing but lodge pole pines. He and I were just sitting there and for what ever reason we both got the chills. He turned to me and said,” Toni we are leaving right now! We turned off the camp stove and threw everything in the back of the van. We jumped in and fired up the van and sped down the freeway until miles later we stopped and just looked at each other. We both felt the same dark dread and we both responded the same way. He was just as scared as I was and he was ten years older than I was and he has never felt like that before…all I can say there is a reason we feel fear and our hair stand up behind our neck and that is to say run like hell. Many years later I was in an office waiting to see my doctor about my back, and there was a picture of Crater Lake on the wall. I told her the same story to the nurse that was taking my vitals and she looked at me and told me that she and her husband had the exact same experience in that same area of Crater Lake. She was so taken back by my own personal experience. We both had theories about what happened to us, but we both felt that we did not want to go back there again. Agreed. My experience has never been negative with him. okay thats not the real “hatman” on the picture but very good demonstration. to clear everything up for you all . 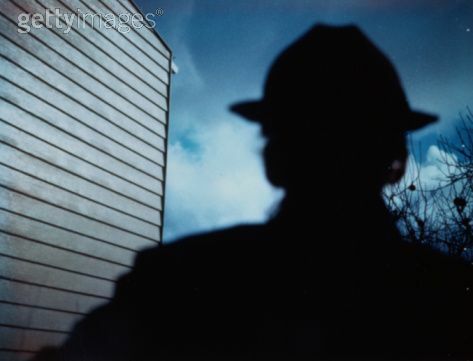 The “hatman” is not a ghost or phenomenon . He is someone that you all know and learned about since a child . I saw multiple of times . when i was mostly alone at night and sometimes during the day . i started having unexplainable seizures for years and went to thousands of doctors and no one could help. Then after years researching and looking for answers …. I found exactly what i wish i did not .. i stumbled across a book pon the internet that explained everything exactly how i and others experienced it . and when i scrolled up a few pages i saw the names “Matthew” Luke etc (all the names of the ‘Bible” ) and then I realized that what i was reading called “The Codex Sinaiticus” was the worlds very first complete handwritten scripture of the “bible” except it had 2 extra books and somethings were changed (e.x luke had 26 verses less than the modern bible.” long story short . The Hatman ,The shadow with the gentlemen outfit ,the grim reaper shadow and the one with the hoodey is all ONE PERSON. and the shadows around the corners thats disappears quickly when u turn to look at them …. they are his “workers” in reality he’s fallen angels . So sorry but your dealing with the devil here. 2 days before my baptism he tried to literally kill me twice to make me give up on my GOD. but did not succeed (almost did) after my baptism he tried me a few times again ,but could easily rebuke him by asking the Lord to rebuke him or to rebuke him myself by saying a few important verses from the bible (In my case the codex ) and he still tries but doesnt prosper cuz the fear i felt for him once , turned around but beware he then targets your loved ones . GOD BLESS YOU ALL , And resist the devil and he will flee from you . Make sure to learn your authorities and permissions as a child of God (or else your screwed) but the most important part is to know . He already lost and only has a short while on earth. my uncle is in the hospital and he has been hallucenting and he was talking to someone in the room while we were in there when we asked him to describe him i knew exactly who he was talking about because me and my grandmother seen him before, my uncle then started to ask for his own hat so he could leave with him.